Few individuals have had a bigger impact on British fashion than Kate Moss. She’s one of the world’s most famous supermodels, having modelled for everyone from Calvin Klein to Burberry, as well as collaborating on sell-out lines with Topshop. Over the years, she’s also become tabloid fodder due to her high profile relationships with rock stars and her no-nonsense approach to life. Whether it’s in front of a fashion photographer or paparazzi, Moss has carved out a distinct sense of style during her time in the industry. Wednesday January 16 marks her 45th birthday, so what better time to reflect on the fashion lessons she’s taught us? Over Moss’s 30-odd year career, one thing becomes abundantly clear: She’s not one to underestimate the power of black. And when we say black, we mean all black everything – from head to toe. Think Morticia Addams, but make it fashion. Croydon-born Moss was discovered in 1988 when she was just 14 years old. This meant she became a household name throughout the Nineties – a time when grunge fashion was popular. It was also the era of “heroin chic” – a style of uber-skinniness which didn’t exactly send the best message about body positivity. Another thing this decade instilled in Moss was a penchant for going braless – something she’s carried with her throughout her career. For Moss, anything and everything can be accessorised with a black jacket. Whether you’re dressing down in jeans or heading to a formal event in a gown, a black tuxedo-style jacket can be thrown on the top for any occasion. Of course, as this is Moss we’re talking about – chances are the rest of her outfit is the same colour, so at least she won’t have to worry about whether her jacket matches. Moss’s style can definitely be described as more edgy than romantic. Basically everything she wears is a masterclass in power dressing, so it comes as no surprise she loves a well-tailored suit. Of course, black is her favourite, but she shows how other colours – like a striking silver – can be used to just as much success. Boho is not a trend that has aged particularly well – you don’t really see many people with long flowing skirts and lots of bracelets nowadays. However, Moss demonstrates how to take inspiration from the boho vibe while still keeping things fashionable. 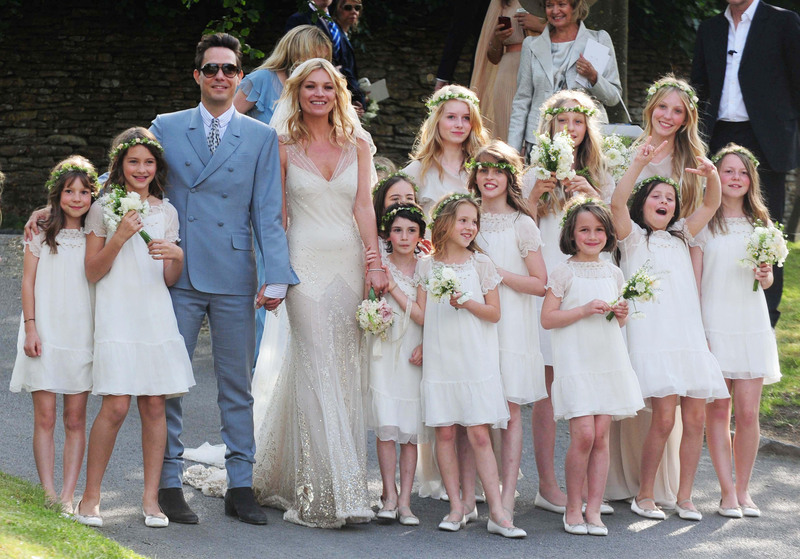 A prime example of this is her wedding dress for her 2011 marriage to Jamie Hince. Designed by John Galliano, it was flowing and ethereal, covered in delicate stones – the perfect mix of boho and elegance. Back in the day this was a style lesson we learned from the supermodel. She loved a little waistcoat – particularly if it was paired with teeny shorts. When her first Topshop collaboration was released in 2007, who among us didn’t want one of the waistcoats so we could look like her? We didn’t necessarily learn this lesson from Moss because it’s highly impractical. However, she did show us that heels work for almost every occasion – even walking through the mud at Glastonbury. As she’s a supermodel, she made this tricky task look graceful – thanks to having a rock star to hold onto.